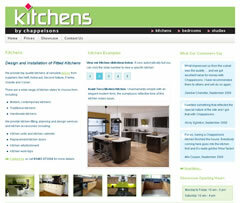 Earlier this year, we were asked to design a new website for Chappelsons who are a local company that supply and install fitted kitchens, bedrooms and home studies. The existing website was quite old and we jumped at the chance to redesign it based on the company's newer logo. This is a good example of implementing an ‘Easy Slider’ script where it is required; a page where there is very limited space but multiple images and information needs to be displayed. As an alternative to Flash, jQuery and its variety of plug-ins are fast becoming a standard in web design. The lack of pre-loading times is certainly a big advantage of the system, and it will be interesting to see just how much this will develop over the next few years. Maybe we could have some further examples of using jQuery in website design. These excellent examples help you visualise how jQuery can be used to proper effect in the right design context.